Before Flight. 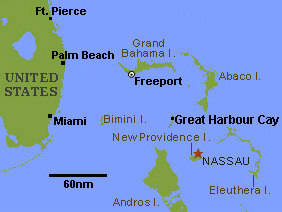 Do thorough flight planning, get a full briefing (including a check on whether Warning Area W-497B just off the coast is hot, in which case simply fly down the coast to the Stuart/Jupiter area before making the over-water hop) and file an international VFR flight plan direct to Freeport (airport code MYGF). The international flight plan is essentially identical to a domestic one, except that it includes survival equipment (e.g., lifejackets). At departure airport do a thorough pre-flight check, put sufficient fuel plus a healthy margin and check your lifejackets (you may rent them in Ft. Pierce, but regular $5 - 10 boat lifejackets also work). Approaching Freeport. Follow proper procedures for controlled airspace. If you are flying below 6,000 feet and didn't get flight-following, you must contact Freeport Approach Control on 126.5 before entering the Grand Bahama TCA. You'll get a squawk code and be directed into Freeport. Ask Freeport Approach if they can close your flight plan (if not, request a temporary frequency change to do it, calling Freeport Radio on 122.3 and then returning to Freeport Approach on 126.5). Freeport Approach will transfer you to the tower on 118.5. Immigration and Customs. After landing, each U.S. citizen will need to show whatever is needed to re-enter the U.S. (an unexpired passport for U.S. citizens), each person will need to fill out a simple form, and the pilot will need to fill out a second form (get the form on line here and see how to fill it out here; you need 5 copies of the form, 3 for entry and 2 for departure). Unlike Mexico, there is no requirement for aircraft insurance, and you will not be asked for aircraft registration, pilot's license, or radio operator's license -- just your passport. (Arrivals before 9AM or after 5PM or on weekends and holidays incur an Immigration overtime fee of around $50 per airplane). Before Flight. Do thorough flight planning. A toll-free, blue, direct-connect phone is provided at MYGF for a free call to Miami FSS so you can get a full briefing, including a check on whether Warning Area W-497B northwest of Freeport is hot (if so, simply avoid it by flying west-northwest towards the Stuart/Jupiter area and then turning north towards Ft. Pierce). Do a thorough pre-flight check, including a visual check of fuel quantity; fill-up if needed. Then use the blue phone again to call the Customs office of your U.S. arrival airport (Ft. Pierce) so that you may file a Flight Arrival Report. The blue phone is even pre-programmed with the phone numbers of all Florida port-of-entry airports. Give the Customs officer your aircraft's tail number and arrival time, and he'll ask a) number of people, b) citizenship, and c) whether it's a private or charter flight. You don't file your flight plan by phone when you get your briefing from Miami's FSS; instead you file a written international file plan at the airport and pay a nominal charge. Finally, the pilot will fill out a Bahamian Customs form similar to the one he/she filled out on arrival (see sample) and each person pays a $15 departure fee. The procedure out of Freeport is like that of a typical Class C U.S. airport, with Clearance Delivery assigning you a departure squawk. Monitor Miami Radio and 121.5. If you choose not to get Flight Following (next step), stay monitoring Miami Radio on 126.9. Also monitor 121.5. See important footnote. Immigration and Customs. After landing at your selected airport of entry, each U.S. citizen will need to show a valid U.S. passport, each head of family will fillout a simple Customs form, and the pilot must fill out a U.S. Customs Form 178 and show pilot's license and medical certificate. Form 178 should be filled out prior to arrival; SOAPA organizers plan to provide them, but you may get it online here. The aircraft must also have a U.S. Customs annual user fee decal, which costs $25. You may apply for it online here. However, if you don't get it before the trip, you may pay the user fee at the airport Customs office upon arrival.